Last night I dreamed of small Mac laptops and today those dreams were fulfilled. The MacBook Air has arrived, a third MacBook model that brings incredibly small size to the MacBook line at a premium price. After spending 20 minutes with the MacBook Air at Macworld Expo Tuesday, I’ve got some first impressions that will have to last me until we’re able to walk away with a shipping unit and put it through the usual testing rigamarole in the Macworld Lab. 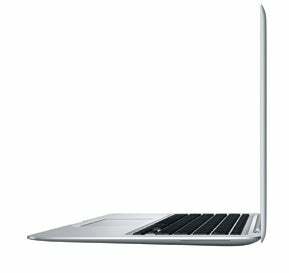 At the risk of sounding obvious, the MacBook Air is incredibly light and tiny. Its looks owe a lot to the MacBook Pro and previous silver Mac laptop models, but its curved edges and tapered shape are unlike anything we’ve seen on a Mac laptop in a long time, if ever. Someone sitting next to me just likened it to a really big iPod nano, and that’s not far off. Because of the product’s curves, there aren’t flat spots on the side for ports, as there are on existing Mac laptops. On the left side, near the back, is a slightly recessed space on the MacBook Air’s underside with a MagSafe power connector. As a result, the MacBook Air comes with a different power brick, a smaller 45-watt brick than the one the MacBook uses. And the adapter’s tip is different, a right-angled silver shape that’s designed to nestle snug against the MacBook Air’s side. If Apple had used the current MagSafe adapter, it simply wouldn’t fit—that adapter sticks straight out, an orientation that would prevent you from setting the MacBook Air down on a desk. On the MacBook Air’s right side is a drop-down door with three ports. (It’s not a door that you flip open to expose the ports—you actually pull the door down, and the three ports come down from within the computer. There’s a standard speaker/headphone minijack, a USB 2.0 port, and a micro-DVI port. Yes, IT people, this means you will need to carry around yet another spare set of Mac laptop display adapters—mini DVI for MacBooks, DVI for MacBook Pros, and micro DVI for MacBook Airs. The best news I got about the MacBook Air was its video-out prowess. It seems to have the same skills as the MacBook, namely that it will drive a 23-inch Apple display as a secondary display. For someone like me, that’s a key feature—speaking as a guy who uses his MacBook at work hooked up to a 23-inch display, robust video-out features are important. The good news is, MacBook Air ships with two video adapters in the box, one for VGA, one for DVI. An optional $19 S-Video adapter is also available. And for those who simply must have Ethernet connectivity, Apple will sell a $29 USB Ethernet adapter. There’s no optical drive in the MacBook Air, and David Moody, Apple vice president of worldwide Mac product marketing expressed to us the ambivalence that Apple seems to have about the current state of the computer optical drive: “Some people will need [an optical drive] Others… maybe.” If you want a MacBook Air but are afraid that you’re going to run into a situation where you simply must have an optical drive, Apple will sell you an external $99 USB SuperDrive, nicely color-matched, specifically for the MacBook Air. 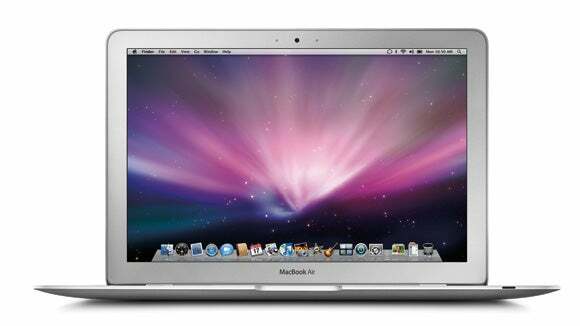 For basic optical drive needs, though, Apple’s new Remote Disc software will let the MacBook Air take control of the optical drive on a Mac or PC. The laptop comes with software you can install on Macs or PCs, enabling the feature. Then when you click on Remote Disc in the Finder’s sidebar, you’ll see a list of all the computers on your local Bonjour network that have Remote Disc installed. Click on a computer and one of two things will happen—either you’ll just take control of the drive, or (optionally) the user of the other computer will be prompted to allow you to take control. When we tried the feature out, it worked seamlessly. We double-clicked on a remote PC across the room, and after about five seconds I could hear its optical drive quietly begin to whir. Within another few seconds, the Microsoft Office 2008 install disc appeared in the Finder on the MacBook Air, just as if we had inserted that disc in the MacBook Air’s nonexistent optical drive. Open the magnetic latch of the MacBook Air and peer inside, and you’ll get a sight that looks a lot like a miniature combination of the MacBook and the MacBook Pro. There’s aluminum everywhere, with the exception of the black backlit keyboard and the 13.3-inch display. That display, at 1,280-by-800 pixels, is the same size as the one on the MacBook. It's backlit via LEDs, which Apple says give the display full brightness the moment they turn on, as opposed to other backlights that take a while to brighten to full intensity. Just above the display is an iSight camera, flanked by two small micro-perforated circles. The one on the left is an ambient light sensor, which lets the MacBook Air automatically adjust the brightness of the display and of the keyboard backlighting. the one on the right is a microphone. As far as I can tell, the MacBook Air’s keyboard is identical to the one on the MacBook, complete with square keycaps and the same solid feeling when typing. Aside from Remote Disc, the other big new software addition with the MacBook Air is the modifications to the Keyboard and Mouse preference pane to support the new multi-touch enabled trackpad. In our demo, we saw the gestures at work in both iPhoto and Safari, though presumably these are features that third-party developers will be able to add to their applications as well. In Safari, we saw the iPhone’s pinch gesture adapted to allow you to size the text in your browser window up and down. You can also swipe with three fingers to use the browser’s forward and back buttons. It’s quite a mind-bender to see full QuickTime movies in the System Preferences pane, but that’s the interface Apple has chosen to get across the various gestures the trackpad supports. The more prosaic side of the preference pane collects the gestures by finger: one-finger actions (tap, drag, drag lock), two-finger actions (click, scroll, pinch, rotate, zoom), and one three-finger action (swipe). Finally, it’s worth mentioning that the MacBook Air’s tiny .16-inch thin front side still has room for two pieces of actual hardware: an infrared receiver and the ubiquitous pulsating sleep light. Stay tuned to Macworld.com for more information about all of Apple’s new products in the days and weeks ahead. And be sure to check our Macworld Expo page for more on everything being announced at Expo.